Our unfinished A House Divided candle boxes are great gifts for any occasion. Our candle holder has two side that represent the Dolphins fan in your house and two sides that represent the Packers fan in your house. They make wonderful table centerpieces or just a nice room accent for your candles.Great gift or that split family of Dolphins/Packers fans in your life. My sons and I make each candle box here in my shop. We do all the cutting, sanding, and engraving ourselves so we can make your candle box personalized just for you. Our candle boxes are made from 1/8" baltic birch plywood and the outside dimensions are 5x5x5. 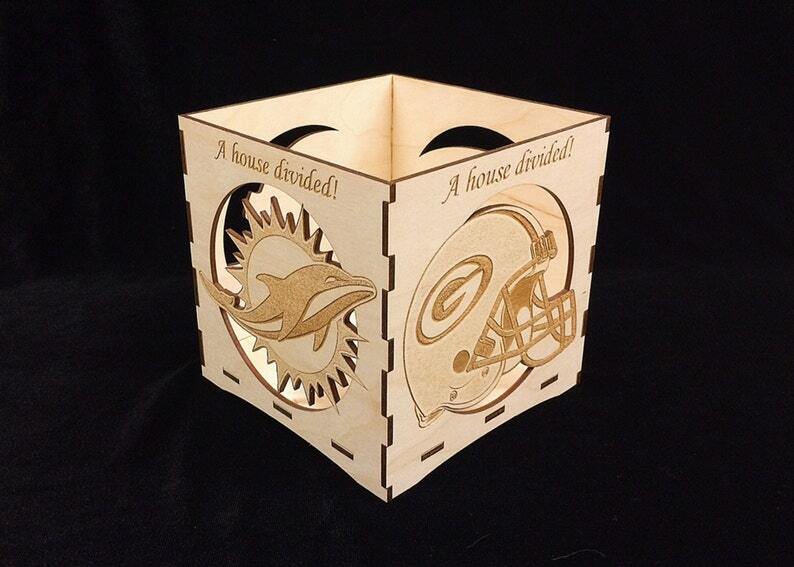 These boxes are engraved with 2 different Miami Dolphins and 2 different Green Bay Packers images on alternating sides with the text " A house divided" over the top of each image. This is very very cool. Not to mention the fact that the shipping and response from seller was great.